When writing a blog solely about tacos it's hard not to be repetitious. But what makes the taco such an interesting food is that even though the ingredients may be the same(tortillas, meat, salsa) it can be interpreted in so many different ways. Since I've been on this taco journey I've found it interesting the way some taquerias choose to prepare their meats compared to others. I've had thick slabs of beef and pork and I've had finely chopped and braised cuts of meat. I've had salsas that make me sweat it out and wimpy salsas that make me yearn for that chile pepper Homer Simpson swallowed that made him hallucinate. I've had it all man but I can't get enough. I love tacos. This curiousity towards the taco is why I stop at every taco truck and it's how I found myself at Tacos Juanita's at the corner of 3rd and Western. I wasn't ravenously hungry but I'm a taco reporter and I saw signs of taco activity. The menu kept it simple with carnitas, asada, al pastor, cabeza and lengua to apply to taco, burrito or torta. One of these days i'm gonna give cabeza another go but on this night I stuck to asada and al pastor. I sat back and watched the operation go into full effect as the meat was thrown on the grill and smoke billowed out of the top of the taco trailer. Tubs of condiments sat on the counter connected to the trailer and I spooned some salsa and onions and cilantro on my tacos. They also had a salsa verde and some whole jalepenos as well as radishes and marinated carrots. As far as the taco triangle these tacos passed the test. The tortillas were firm and oiled just right and the beef was salted and tender without any gristle. The salsa had a little spice to it which was good and overall I really enjoyed the asada. The al pastor lacked the peppery and bbq flavor that I look for when it comes to great al pastor.It was passable but when compared to El Matador up the street it wasn't in the same ballpark. Overall it was a positive taco experience. The beef tacos were enjoyable and the salsa added to the flavor of the tacos. 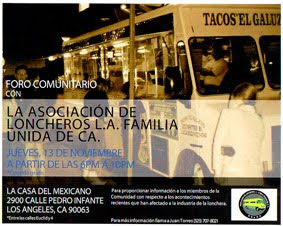 They're open late so after you're making a fool of yourself at the karaoke bars in koreatown swing by Tacos Juanita's for the asada tacos. Noone wants to hear you sing "Delilah" anyway. bandini - So no Cabeza for you? 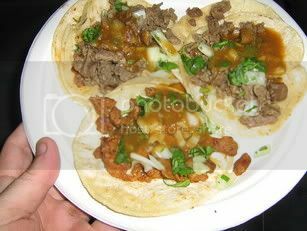 I'm still searching for a place that has good cabeza and lengua here! I've had some terrible cabeza, but when it's good!!!! Sounds killer B - you gonna make me miss my deadlines at Tacogater 'cause I'm too busy running down your new posts. I've had cabeza twice and both times it was too gamey. Wrote it off as just not my thing but I may have just had bad quality cabeza. I think i'll start ordering it again. Sabores de Oaxaca looks good! I'll have to check it out. I drive by there all the time. hola amigo! scanning your blog i noticed a posting about a t-truck on 51st and figueroa. i thought, hey that's my neighborhood! NOTE: re-reading your post i see you mention a "food 4 less" market as the location of the truck. do you mean avenue 51 instead of 51 street? the first is at 50th and main. big white tent - n/e corner. another identical birria corner is at 55th and san pedro. same hours and prices. super friendly. it's in the parking lot of a tiny market that sells beer which you can enjoy with your meal. next stop is around the corner from the first at 51st and wall. the front of a small apartment building, look for the blue tarp covering the front. there are many more at night at various corners and front yards of houses. thanks for the taco reccomendations. It's been awhile since i've had birria. 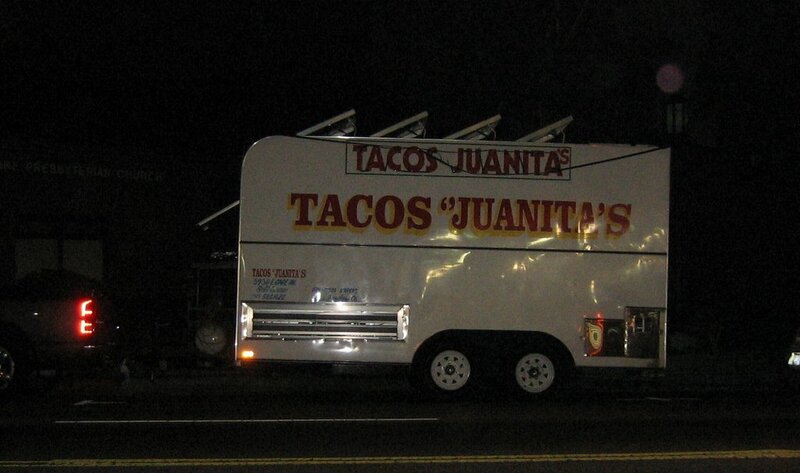 tacos juanitas just got better!!! the salsas are more spicier and the burritos are deliciouS! THOUgh the menu is small , their food is the best , trust me their cabeza is the best !!! and thei lengua as well as the alpastor and asada, chorizo and chicken. you have to be patient though they get alot of customers on the weekends! oh , and their tortas are the best! they also have quesadillas . the people over there are kind. and that one girl is very pretty too!! so go check out tacos juanita's , they are the best !! !